Efforts to end Israel's Operation Pillar of Defense in Gaza are underway: UN Secretary General Ban Ki-moon is scheduled to visit the region on Tuesday in order to advance a ceasefire between Israel and Hamas. Ban is expected to visit Jerusalem and Ramallah, but he will apparently not visit Gaza. The UN chief is scheduled to meet with Prime Minister Benjamin Netanyahu, Defense Minister Ehud Barak, Foreign Minister Avigdor Lieberman and Palestinian President Mahmoud Abbas. The visit was coordinated following a closed-door meeting of the Security Council following the escalation in Gaza. On Thursday Lieberman spoke to some of his counterparts around the world, including the foreign ministers of German, Italy, Britain, France and Bulgaria, to explain Israel's policy. Lieberman told them that Israel is doing its best to avoid civilian casualties in Gaza, while the Palestinian rocket fire is targeting civilian population in Israel. The FM stressed that Israel will not agree to a truce that may be violated again in a week or two and wants to create deterrence that will bring an end to Palestinian terror activity against the Jewish state. Meanwhile, French President Francois Hollande has begun talks with Netanyahu and other world leaders to avert an escalation of violence in the Gaza Strip, Prime Minister Jean-Francois Ayrault said on Thursday. The killing of a Hamas commander by the Israeli military on Wednesday has sparked a wave of reciprocal attacks between Israel and Hamas, which rules Gaza, culminating in the death on Thursday of three Israeli civilians. "It's time to stop this escalation, which is dangerous for the security of Israel and its people and for that of the Palestinian people," Ayrault told reporters during a visit to Berlin. France had made "direct contact" with Netanyahu and Egyptian President Mohammed Morsi, he added. Also on Thursday, the UN said a teacher who worked for a relief agency was killed in Gaza by Israeli air strikes. The UN Relief and Works Agency for Palestine Refugees in the Near East said that Marwan Abu El Qumsan was killed Wednesday. El Qumsan was in his early 50s and taught Arabic at UNRWA's Preparatory Boys School in Jabalia, and was in a car near the scene of an airstrike, the agency said in a statement. The agency said the violence in Gaza forced it to close its schools temporarily. 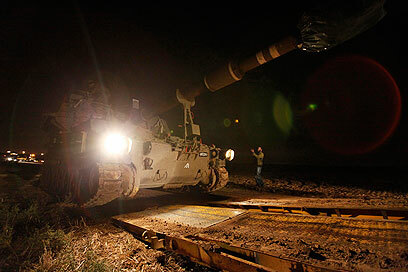 The IDF continued its preparations for a possible ground incursion in Gaza on Thursday, with the Defense Ministry asking the government to authorize the call-up of some 30,000 reserve soldiers. See all talkbacks "UN chief to visit Israel as part of truce efforts"